Fill 5-quart Dutch oven two-thirds full of water; heat to boiling. Meanwhile, remove strings from sugar snap peas, if desired. Add peas to boiling water; boil 3 minutes. Add linguine; boil 2 to 3 minutes longer or until peas and linguine are tender. Meanwhile, in 12-inch nonstick skillet, melt butter over medium-high heat. 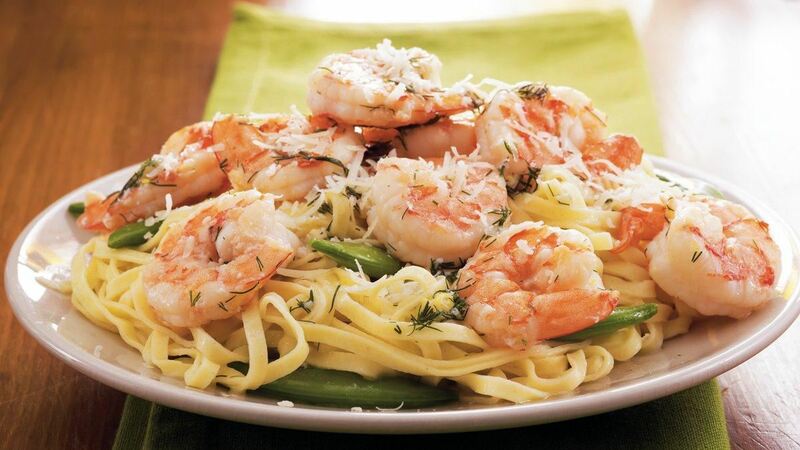 Cook and stir garlic and shrimp in butter 1 minute. Stir in wine and lemon peel; cook 2 minutes or until shrimp are pink. Drain linguine and peas; place in large serving bowl. Add shrimp mixture and dill; toss to combine. Sprinkle with cheese. Serve immediately.